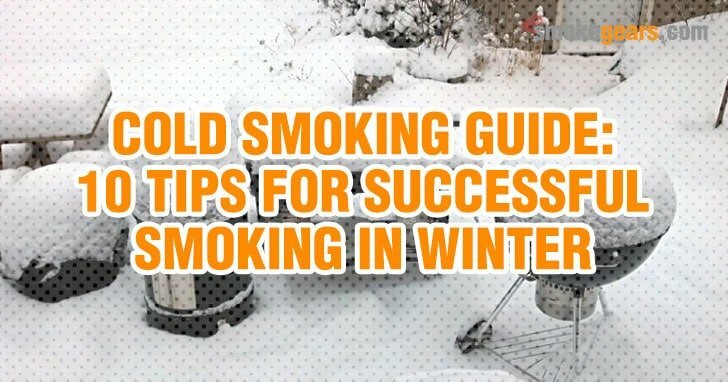 There are numerous facts you should bear in mind while planning a cold weather smoking. However, in this updated guide, we have identified and succinctly discussed 10 pertinent cold weather smoking tips worth mastering. Smoking in winter, you will inevitably have to strive through the initial grill lighting phases regardless of your individual smoker. However, what makes the difference is the ability of your smoker to maintain temperature. Most thin-walled smokers such as Smokey Mountain and Weber Kettle offer a perfect example of such. You will struggle getting them on and again struggle to get them do the job. In short, their design causes them to lose heat fast. On the other hand, thick-walled insulated ceramic smokers maintain steady flow of temperature for longer once they’re on. Now, another critical choice lies in determining the exact type of smoker. Gas smokers aren’t bad for cold smoking but you need to invest more in fuel. This applies to pellet and charcoal smokers. On the contrary, electric smokers are the best preferred for cold smoking because of steady heat flow. Insulation of your smoker will enable your thin-walled Smokey Mountain or Weber grill to unbelievably preserve heat for longer hours. However, in contemplating about this, the question of cost implication automatically intrudes. Here we come with the ultimate relief: furnace insulations and welding blankets aren’t as expensive as a cold weather jacket. Most importantly, what matters is the science in the process of insulation rather than the method itself. Unsurprisingly, enthusiasts have even used aluminum foil to insulate their smokers at believe it has worked out so very perfectly. Once you have your smoker wrapped up in a perfect insulator, working in the freezing condition will no longer be a matter of life and death. In the winter conditions, possibilities are that the snow forming in your backyard will end up forming around your grill. This in turn causes slipperiness and generally makes it uncomfortable to grill. In such cases, prior to the actual grilling, be sure to clean out all the snow and pre-heat it before actual usage. In essence, this makes your successive grilling tasks easier. Additionally, it helps to prevent possible accidents such as breakages and falls. The process of grilling also becomes neat and uninterrupted. Fuel consumption in grilling during winter is apparently higher compared to grilling in spring or summer. In your budget, you will thus have to spare a little bit more of your income to purchase more fuel. This cuts across most grills including charcoal, gas and wood pellets. An explanation for this is simple: in winter, grills take longer to heat up to the desired temperature. Budgeting for the usual amount of fuel may unexpectedly frustrate you, which is why you’ll find this tip helpful. As you grill, remember that any attempt to open up the lid to peek adversely affects your BBQ. Peeking for 5 minutes increases your cooking time by 15-20 minutes on average. Considering the cold air that enters, this may even be worse. If it’s raining, worst. First and most important remedy, use your remote thermometer to determine the progress of your cooking food. Most importantly, be patient and trust that the values on your thermometer are real unless you’ve detected something unusual. Before you set off your barbeque in winter, ensure you wipe all the ice off your grill. In fact, it is never advisable to allow water to reach your grill. So at all times, it is imperative to ensure that your grill is dry. Before and after using, be sure to wipe it well, including inhibiting any snow underneath your grill. The effect of snow whether directly or indirectly on your grill is the inhibition ideal temperature attainment. If you don't have your grill then you can try to cook your frozen steak in the oven. Protect your smoker and BBQ at large by placing your smoker under a perfectly sheltered spot. With attention to wind and rain, you will be able to carry on your grilling interrupted. When smoking in your backyard, you can either choose to smoke from a sheltered place or improvise your own shelter. Worth-noting is the fact that different shelters serve different purposes. It isn’t necessarily significant that your single shelter should serve multiple functions if it can only serve one. Side shelters will of course work well to prevent the malice of wind while upside shelters prevents the effect of rain. So with this review, you clearly understand where to mount your BBQ depending on the prevailing weather during winter. Grilling is hot yes, but that doesn’t mean you shouldn’t dress warm clothes. Always dress for the weather and not for the activity you’re undertaking for your own safety. Warm clothes secures you from contracting related diseases and infections. In so doing, remember that you are dealing with fire and its effects are apparent. In regard to this, never leave parts of your clothing hanging. They may catch fire and cause accidents. Similarly, even if they do not cause fire, other accidents are apparent when your fabrics and scarf are hanging. When you smoke in cold weather or rainy outdoor conditions, the best and only remedy is to use a cold weather jacket. It is perfectly and purposely designed for this function and trust that it won’t ever let you down. In this case, a cold weather jacket plays the role of an insulator and a shelter at once. This leaves the consistency of the temperature you’ve strived to achieve uninterrupted. Experts recommend a cold weather jacket that is just sizable to prevent leaving some parts uncovered. Markedly, better have a larger jacket than a smaller one. Whether you choose to store your grill indoors or outdoors, it is in your best interest to choose. If you’re storing it inside, remove its propane tank and store it in an upright position. Never store the propane tank inside the garage, house or other building. Conversely, if you have to store your grill outside the propane tank should remain connected but should be shut off. Remember to protect it with a cover. Compared to smoking under normal conditions, cold smoking, as one can see, requires an extra mile of care. You need to take extra caution and ensure safety for your grill, yourself and your BBQ in general. Needless to say, ice is the worst threat in cold smoking. As a new barbeque lover, you can make mistake when smoking. There are several grilling and smoking mistakes you should know. You know all the techniques about cold smoking. Now ensure, you have all the grilling tools and of course the kitchen tools you have near your hands. Its accumulation causes not just possibilities of accidents but messes up everything. With due regard, this guide is of utmost significance, if consideration is given to every point highlighted.